Don’t know about you, but Metro Rhythm has been feeling the cold. In harsh months, fettered by an absence of fantasia, one searches for what will suffice; that which will excite the senses and tickle the mind. And that, my friends, is poetry and wine. This month, Metro Rhythm is proud to present Ken Chen, Alex Dimitrov, E.C. Belli and Sam Ross (plus cheap booze and long smoke breaks) for our first reading of the year. The event will be held on February 18th, 2011, and as always, is free and open to the public. 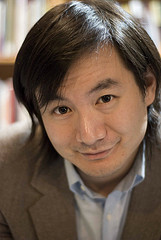 Ken Chen is the 2009 recipient of the Yale Series of Younger Poets Award. His debut poetry collection, Juvenilia (Yale, 2010) was selected by Louise Gluck. A graduate of Yale Law School, Mr. Chen abandoned a promising career at a Wall Street law firm to become the Executive Director of The Asian American Writers’ Workshop. His work has been published in Best American Essays 2006, The Boston Review of Books, The Yale Anthology of American Poetry, Fence, jubilat, Film International, C-Theory, Radical Society, and Art Asia Pacific. Alex Dimitrov is the founder of Wilde Boys, a queer poetry salon in New York City. His poems have appeared or are forthcoming in the Kenyon Review, Yale Review, Boston Review, New York Quarterly, and others. He works at the Academy of American Poets and frequently writes for Poets & Writers magazine. A Swiss native, E.C. Belli’s poetry and translations have appeared or are forthcoming in FIELD, Hayden’s Ferry Review, The Antioch Review, Western Humanities Review, Caketrain, Mid-American Review, Europe: revue littéraire mensuelle, PO&SIE, Voix d’Encre, and Cerise Press, among others. Her chapbook Plein Jeu is the winner of Accents Publishing’s 2010 Poetry Chapbook Contest and her work was recently nominated for a Pushcart Prize. She is the recipient of a Paul & Daisy Soros Fellowship for New Americans and writes in both French and English. Sam Ross was born in Indiana and is currently a student in the M.F.A. program in poetry at Columbia University. He has a B.A. in English and Political Science from Indiana University and a Master of Science in Teaching from Pace University which he earned while teaching 8th grade English in Brooklyn with Teach For America. He was a finalist for the Sycamore Review‘s Wabash Poetry Prize and has work forthcoming in an anthology from Argos Books.